So I was browsing the ESPN site and caught a glimpse of an article that was written by Trent Dilfer about the grading of this year’s quarterback performances. I went to look at the article and was hit with the brick wall that is the ESPN Insider block. Darn it!! I thought to myself that I know at least a thing or two about football and I can make my own list. Something that was plastered all over ESPN for both the NFL and college football throughout the year was this concept of the Year of the Quarterback. The thought behind the articles and discussions was that quarterbacks were going to have a big year with records, stories and other happenings that would turn the focus away from other positions. Of course this was going to be true. The quarterback is the single most important position on the offense (and really on the field), unless you are running a wildcat formation for a run or play-action pass on every play. In the college world, everyone set their eyes on the talented Andrew Luck and his decision to stay for his senior season. Meanwhile, the talents of Robert Griffin III and Brandon Weeden were close to exploding into stardom. 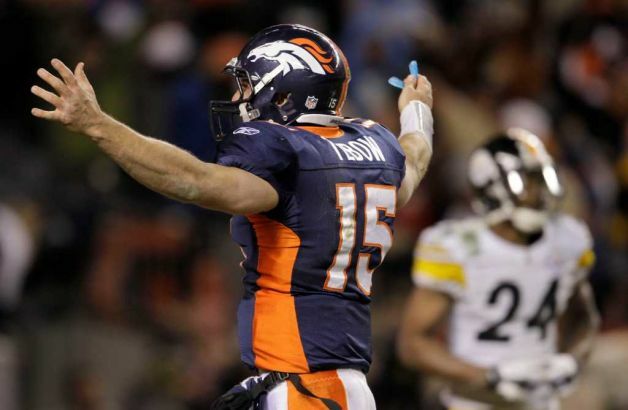 With the recovery of the NFL to hosting a full season, the attention was on five significant areas: the dominance of the elite (Brady, Brees and Rodgers), the newcomers (Newton and Dalton), the stragglers (Grossman, McNabb, Orton and Sanchez), the survival of the Colts without Manning and the possibility of it being Tebow Time. The extra hype around quarterbacks was not needed because there was enough drama and excitement waiting to be discovered. Some truths became evident quickly, while others gradually came into light. In the end, there were not many surprises in the results of the league (unless you count the Tebow-led Broncos making the playoffs), but some teams have a lot to think about as they move forward. 1) Aaron Rodgers (GB) – When your team comes off a fantastic Superbowl run from the 2010-2011 season and then follows up with a 15-1 record and a #1 seed in the following playoffs, you have got to be doing something right. 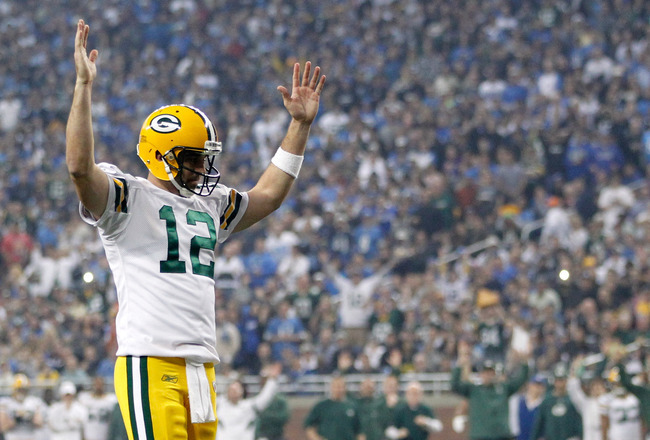 Rodgers has quieted many critics (including Favre) with superb play week in and week out. While he did not lead the league in yards, completions, percentage or TDs, he was the most efficient/effective QB with a rating of 122.5. He also threw for 45 TDs and only 6 INTs. When your team has no running game, the focus falls to the quarterback to lead you all the way. 2) Drew Bees (NO) – Without stirring up a mega debate, Brees is truly only a fraction of a point off of Rodgers. With a record-setting season, including a 71.2% completion rating and 5,476 total yards, Brees had one of his best performances of his career. He also threw for a league-high 46 TDs and finished 2nd place with a rating of 110.6. New Orleans has been know as a gun-slinger offense since he arrived but he seems to just keep getting better each year. 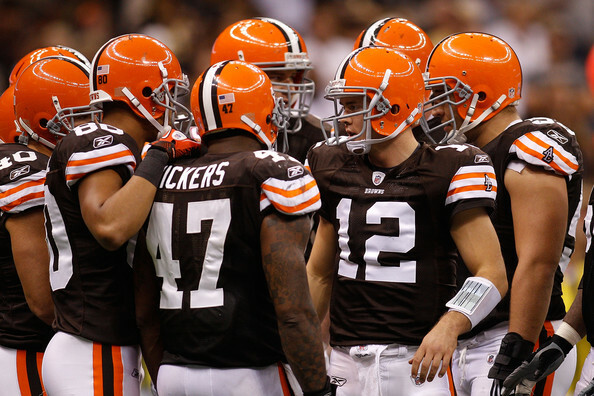 With a stronger running game and a couple defensive substitutions, this could be the team to beat in 2012. 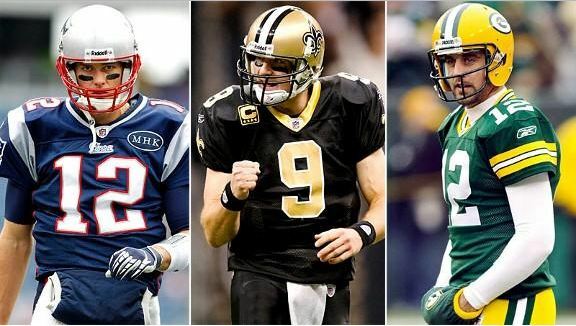 3) Tom Brady (NE) – While it helps to have a guy like Rob Gronkowski making you look good, there is little question that Brady is one of the best of the league and will eventually be a hall of fame quarterback. With three rings already in his possession, he is going for his fourth this weekend in a rematch that is sure to entertain. In terms of his numbers, he had a fantastic season with a rating of 105.6, over 5,200 yards, 39 TDs and a completion percentage of 65.6%. Fantasy owners were certainly happy with his performance. 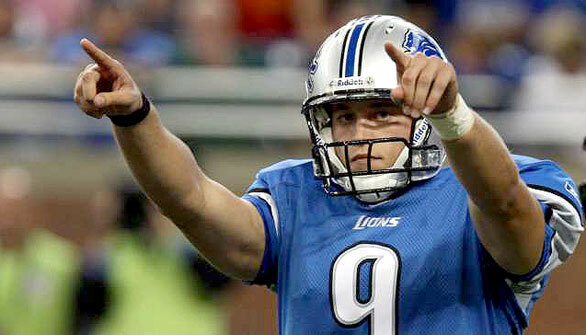 4) Matthew Stafford (DET) – It is not a bad year when you end up be the 2nd runner up in the 5,000 yard club of quarterbacks. Stafford was the QB that everyone believed him to be and finally stayed healthy enough to prove his worth through an entire season. A team that in recent memory was winless only several years ago had now returned to the playoffs and looked to be the team no one wanted to play. He finished the season with 41 TDs and 5,038 yards. 5) Eli Manning (NYG) – While his numbers may not support the placement in comparison to some of the next few quarterbacks, the timing of his success certainly proves his value to the team. Manning was responsible for 6 fourth-quarter comebacks and looked unstoppable in each of his wins. Though the team lost to the Redskins in December and looked to be on the outside of the playoff race, he pulled out one more impressive victory with 3 TDs and nearly 350 yards to knock off the Cowboys and earn the NFC East spot. He finished with 29 TDs and just under 5,000 yards. 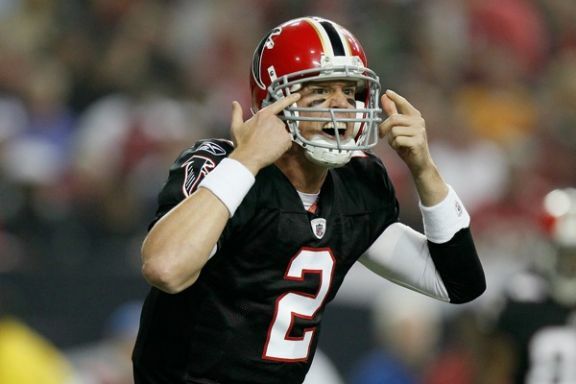 6) Matt Ryan (ATL) – Finishing with a respectable record and an entry into the playoffs, Ryan certainly showed his ability to be productive. He also had his more shaky moments from time to time. Though his statistics included 29 TDs and 4,177 yards, he fell flat when the team needed a stellar performance. Finishing the season with a 10-6 record and losing 2-24 against the Giants still gets labeled a losing season. Ryan has a lot to look forward to with the continued presence of Gonzalez and White and the young talent of Julio Jones. 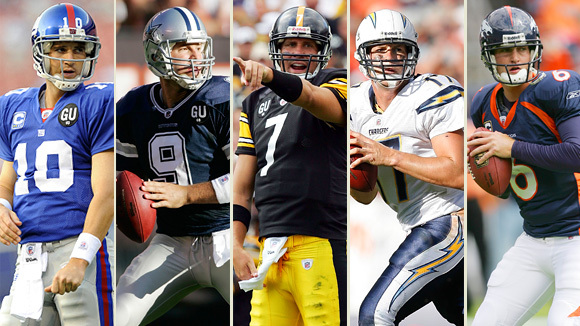 7) Ben Roethlisberger (PIT) – This quarterback is the epitome of battle-tested. Even when he was injured throughout the season and playing with a makeshift offensive line, he completed 63.2% of his passes and threw for over 4,000 yards. His performance took its biggest downturn at the end of the season, but time to rest and some draft and trade moves will give him the tools he needs to succeed. 8) Matt Schaub (HOU) – Except for the season-ending injury, Schaub could have been at least one division higher. In the shortened season (10 games), he put up some impressive numbers, especially in his final game against Tampa Bay with 242 yards and 2 TDs. He finished his season with just under 2,500 yards, 15 TDs and a passer rating of 96.8. It certainly helps to know that TJ Yates is around to help out in a jam. 9) Tony Romo (DAL) – While Romo is going to put up some impressive numbers, they do not seem to turn into wins when he needs them. He is the type of quarterback that just cannot break the threshold to compete in the playoffs. His stats would say that he should be placed higher (4,184 yards and 31 TDs) but his results fall far short. 10) Alex Smith (SF) – Just beating Rodgers for the most productive QB to throw for over 3,000 yards is Smith with 17 TDs and only 5 INTs. The 49ers were all about efficiency, field position and ball control throughout the season (which is sad when you see the performance in the playoffs on special teams). Regardless, Smith had his first year where he looked comfortable behind center and made great use of his quality TE Davis and developing WR Crabtree. 11) Philip Rivers (SD) – In previous years, he would have ranked higher, but his performance was shaking in the middle part of the season. As usual, Rivers made a run at the end but fell short of the playoffs. Throwing for 27 TDs and 4,624 yards is certainly a high mark, but the 20 INTs do not help his performance. 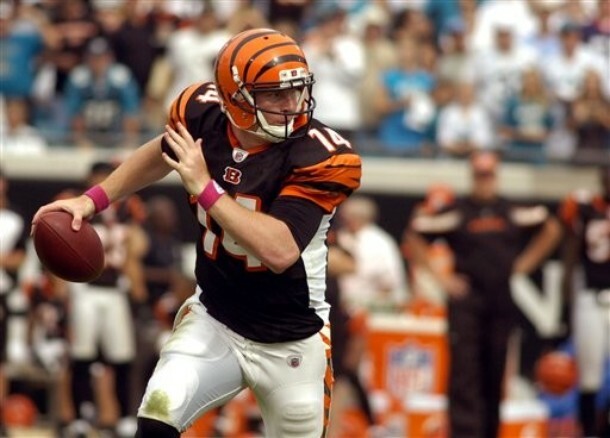 12) Andy Dalton (CIN) – After the drama of Palmer vs the Bengals, Dalton was given the reigns to the team. As a rookie with limited offensive talent in comparison to other NFL teams, predictions were that he would fail to produce in his first season. His 3,398 yards and 20 TDs would speak otherwise, as would his selection to the Pro Bowl in his rookie season. 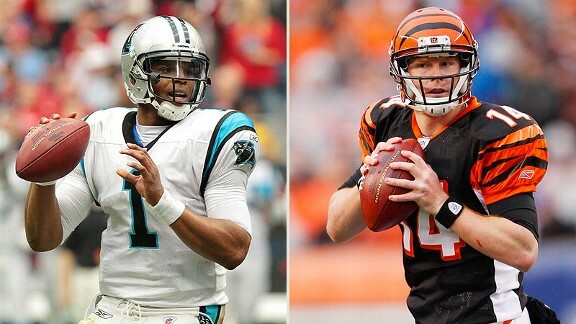 13) Cam Newton (CAR) – I am a little cautious about Newton because his performance as a quarterback was good, but he was better served as a running threat. His 4,051 yards speak well to his arm, but the 21 TDs and 17 INTs are close to being a wash on production. His saving grace was the 706 rushing yards and team-leading 14 rushing TDs. He was certainly a steal fantasy pick. 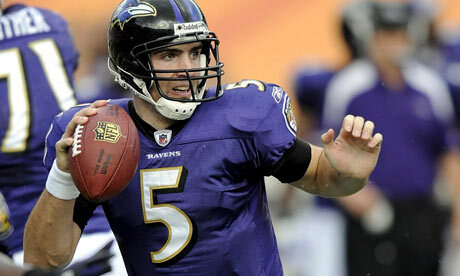 14) Joe Flacco (BAL) – While his 2010 season was better statistically, he lead his team to a 2nd seed in the playoffs and an appearance in the AFC Championship game. He was productive overall but failed to play consistently (especially when you look at his performance against the Titans and the Jets). Still, he finished with 3,610 yards and 20 TDs. 15) Matt Moore (MIA) – While he did not start the season and may not start next season, Moore is a QB that has a lot of potential still remaining. In his best season to date, he was able to bury the embarrassment he experienced with the Panthers. Going into his 6th season, he can be proud of his 2,500 yards and 16 TDs in 13 games. 16) Tim Tebow (DEN) – Though he could actually fit in several of these categories depending on whether judged by quarters 1-3 or the 4th quarter, this was Tebow’s first season at the helm. His success in college did not immediately translate into success in his passing game. He was the only QB to enter the playoffs with a sub 50% completion percentage. If you ignore his overall passing numbers (1,729 yards, 46.5% completion and 12 TDs), his performance in the 4th quarter and overtime led him to a 7-1 initial record as a starter and one of the most entertaining playoff upsets in NFL history over the Steelers in the Wild Card Round. 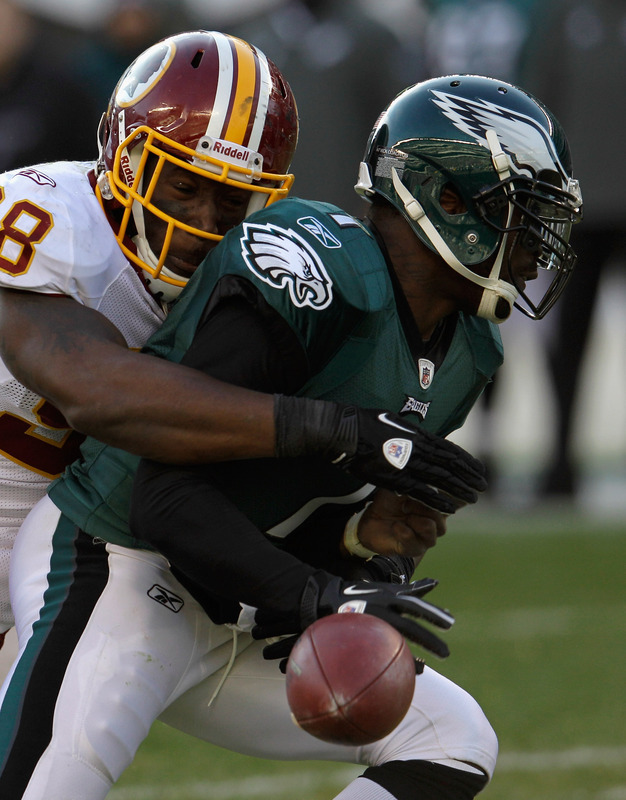 17) Michael Vick (PHI) – The supposed Dream Team fell quickly into a nightmare after the season started. Vick’s previous season was the best of his career, but the team was plagued with significant inconsistency and Vick could not find a rhythm. He still has a chance to recover before the city hits him with a barrage of snowballs but he will need to do better than 18-14 TD-INT ratio, 3,303 yards and 59.8% completion rating. 18) Jay Cutler (CHI) – Without the receiving talent in Chicago, Cutler was doing okay until the injuries for both him and Forte. There is little expectation that he will magically have a miracle season but he can hold it together when paired with a good defense and strong running back. Before the injury, he accrued 2,319 yards and 13 TDs. 19) Matt Hasselbeck (TEN) – His numbers may have been better if he did not lose his best wide receiver so early in the season, but he may have a chance for a resurgence with the Titans. He pulled off a 3,571 yard season and 18 TDs but 14 INTs. Chris Johnson took a step backwards as the halfback, so both players need to improve to compete. 20) Ryan Fitzpatrick (BUF) – Before the contract, his numbers looked great and he pulled off several comebacks. After the contract, he took a nosedive. His production looked great with 3,832 yard and 24 TDs, but picked up 14 of his 23 INTs in the second half of the season and averaged a 66.8 QB rating. 21) Kevin Kolb (ARI) – Unlike the QBs in the above division, Kolb displays the negative side of taking a risk on a potential talent. He ended his season early with an injury and was on pace for some good numbers (1,955 yards passing). The down side was that his TD-INT ratio was 9-8 and his team record was 5-7. Fitzgerald was actually more productive with Skelton to close the season than the averages with Kolb to start. 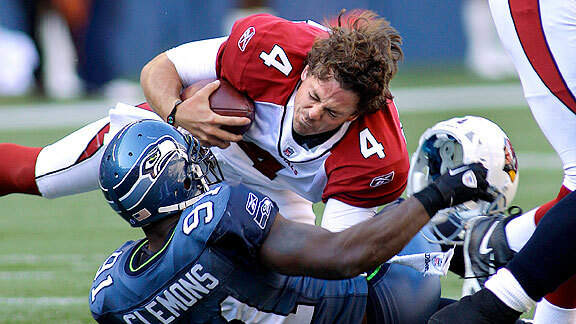 22) Tarvaris Jackson (SEA) – Considering his struggles in Minnesota, he actually fit well in the Peter Carroll system. It helps to have a rusher like Marshawn Lynch, but his numbers only looked average in the end. The 3,091-yard season is a solid statistic but the 14-13 TD-INT ratio compares too closely to his time with the Vikings. 23) Carson Palmer (OAK) – While his debut with the Raiders was a disaster (8-21 for 116 yards and 3 INTs), his season was a roller coaster. He was at a disadvantage because of the squabbles with the Bengals, but he could perform better with most development time with the team. He finished with a 13-16 TD-INT ratio and 2,753 yards. 24) Mark Sanchez (NYJ) – Jets fans will only tolerate Sanchez’s performance for so long. There were times he was in control, which shows in his 3,474-yard and 26 TD season, but he polarized the locker room when he got caught up in the player drama. He also failed to perform when he needed to win even just 1-2 f his final 3 games. 25) Matt Cassel (KC) – His performance was not always needed to win games (such as the shutout win over Oakland with 2 INTs), but there were times with strong numbers only against weaker teams. He finished with 1,713 yards and 10 TDs, but added 9 INTs. 26) Kyle Orton (DEN/KC) – The fans of Denver were clamoring for Tebow Time and Orton made it easier to make the transition. During his final game with the Broncos, he completed on 6 of 13 passes for 34 yards and 1 INT (though only slightly worse than some of Tebow’s games). His move to the Chiefs started with a bang with a win over Green Bay but then dropped back to mediocrity. 27) Colt McCoy (CLE) – When in college, McCoy was a star at Texas. Getting drafted to the Browns is almost as close to an NFL death sentence as you can get. Other than Derek Anderson, there has not been a successful QB in the city of Cleveland (unless you count opposing teams). The best receivers in Cleveland are better served as kick returners. Still McCoy ended with 2,733 yards and 12 TDs. The Browns will probably look at at least picking up another veteran backup QB or potentially replacing him in hopes of finding a better, more consistent leader for the offense. 28) Josh Freeman (TB) – One could argue that he was relatively consistent with a 62.8% completion rating and 3,592 yards. Then you can turn to his point production and find that he threw 6 more INTs than TDs (22 and 16 respectively). He took a team that was predicted to be competitive and turned up a dismal 4-12 season. There is some talent to be salvaged but there is not much left to expect from his career. 29) Sam Bradford (STL) – In his 2nd year, Bradford ended his season early with another injury. Though his numbers were not horrible, they provide little relief when put into the context of an injury-prone #1 draft pick. Before leaving the field, he finished with 2,164 yards and only 6 TDs. 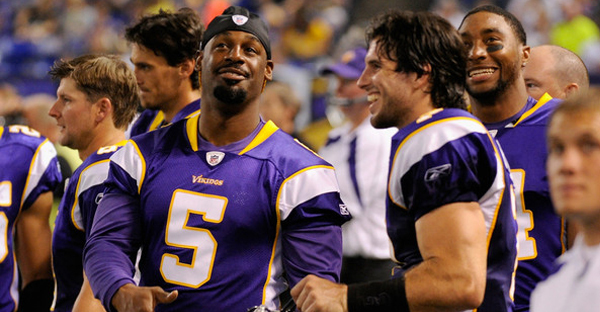 30) Christian Ponder (MIN) – After the McNabb experiment failed, Ponder stepped in and showed a little promise as a rookie thrown into the mix of a tough division. He did not have a solid receiving corp to work with but ended the season with a 13-13 TD-INT ratio and 1,853 yards. 31) John Skelton (ARI) – With Kolb’s health being inconsistent, Skelton had to pick up the slack. The team is better with Kolb, but Skelton could serve as a mediocre backup for the remainder of his career. He finished with 1,913 yards and 11-14 TD-INT ratio. He may get another chance, but it will be with a team like Miami, Tampa Bay or another team that loses their starter early. He at least looked better than Leinart at times. 32) Blaine Gabbert (JAC) – As the rookie that struggled the most, the 12-11 TD-INT ratio is actually a little misleading. He only completed barely over 50% of his passes and was sacked 40 times. With a running back like Jones-Drew, Gabbert will potentially have another chance next season. 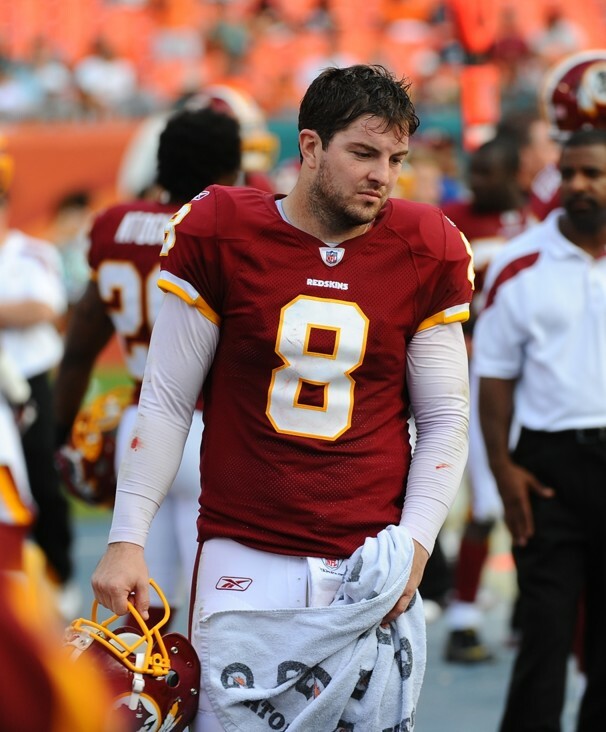 33) Rex Grossman (WAS) – In a season that momentarily appeared to be a surprise, the Redskins took a hard nosedive after the 3-1 start. Though Grossman had a positive game to start the season against the Giants, he racked up at least 1 INT in every game for the rest of the season, finishing with 20 total. As a multiyear starter between the Redskins and Bears, his performance was dreadful with a 57.9% completion rating, only 16 TDs and a final rating of 72.4. Shanahan put a lot of faith in Grossman over Beck, but even got to a point of benching Grossman as the starter in the middle of the season. The 3,151 yards is inconsequential when you only lead the team to 5 wins. After ignoring the need to get a new, young QB, Shanahan finds himself in desperate need of getting a new quarterback. 34) Curtis Painter (IND) – No one expected to see the Colts win without Manning. Painter was a placeholder QB. The conversation now is about picking up Andrew Luck and moving beyond both Painter and Manning for a new future. 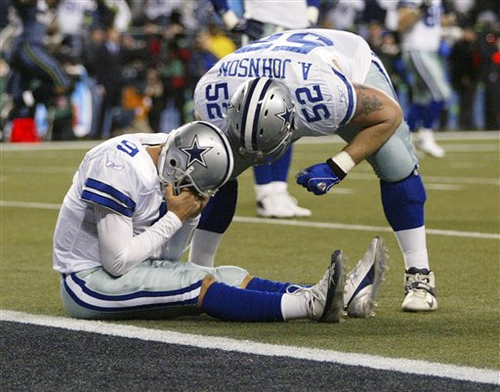 Without a win and getting beaten by the performance of Orlovsky, Painter’s 6 TDs and 1,500 yards will be soon forgotten. A few teams will be playing the draft and trade options hard to capture a new leader for their offense and it is easy to figure out which ones need it the most.